We have a corporate loyalty scheme available for returning customers. We have 24 Schools on our books, why not yours? From Training Heads to Dinner Ladies. All our Instructors at First Aid Southampton are off duty full time Emergency Service Personnel. They have all come from diverse backgrounds, some of which include the Army, Marines, Combat Medic and Rescue Diving. We are also proud to have an Instructor who has the European Rescue Challenge 2009, Best Medic & World Rescue Challenge 2010 & Best Trauma Team under his belt. We draw upon our experiences to make our courses as interesting as possible. This is an independent company and in no way linked to any Emergency Service. 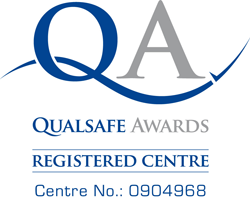 To ensure we meet the highest of standards, we work with an independent company; 'Qualsafe Awards' and we are a Registered Centre. Qualsafe audit our Instructors and confirm that the information we give you is up to date and in line with the Health and Safety Executive. We hope this brings you peace of mind when booking with us. Although First Aid Southampton are based in Southampton City Centre we are able to train anywhere in the UK. We can also offer regular training sessions using meeting rooms in your local area so your staff should not have far to travel. To arrange this or any other training requirements please contact us.